This project all started with a slim pottery jug that my wife had on the sideboard. I was looking at it one evening and thinking, there must be a way of making a similar one in wood, on the lathe. Then one day a stash of wood, which included some amazing pieces of burr oak, elm and acacia was discovered in a farm shed, by the son of an old woodturner. It and had been there for 20-30 years and was perfect for my jug turning project. The Jug was made in two halves. It is in fact two wide rimmed plates, turned and then glued together. But a jug has a wider base than rim therefore the process becomes more difficult by the need to offset the turning halfway through the process, so that the base of the jug is wider than the top. Measurements have to be done carefully so that the two halves are identical. When glued, (I used PVA) the rim is carefully cut on the bandsaw to the required shape and a hole is drilled for the handle with a sharp forstner or sawtoothed bit. The surfaces are then finished through the abrasive grits to 400 and the chucking spigots are removed with a disk sander. I used a herb and resin oil to bring out the colour of the acacia and to enhance the burrs but any preferred oil finish would have done. 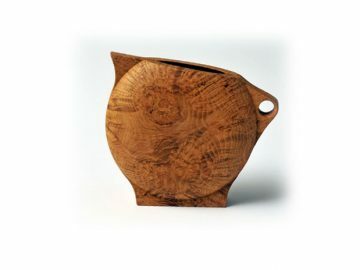 With its amazing burr grain pattern this one was left plain, but the jug provides a great canvas for decorating and texturing, if using a plainer wood. I have made three jugs so far. The prototype, in walnut, sits at home on the shelf with its pottery companion. 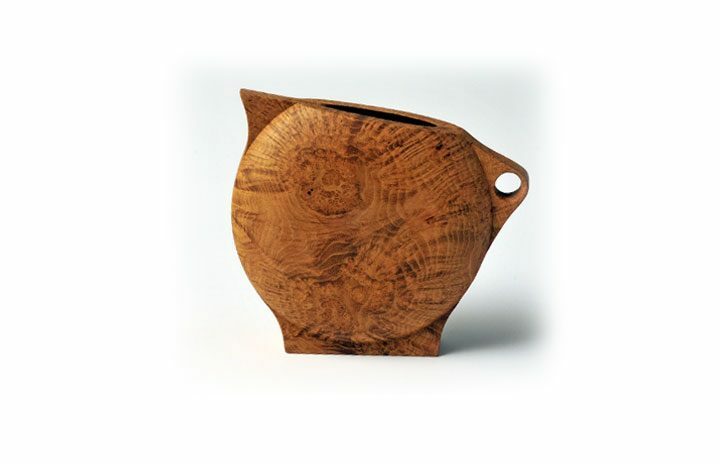 This Acacia one was sold through the Somerset Guild of Craftsmen gallery at Somerton and a larger Elm Jug was selected in the top 50 at the AWGB International Seminar and bought by a private collector.